Small teapots, 12 - 20 oz. Teapots for one or two people. 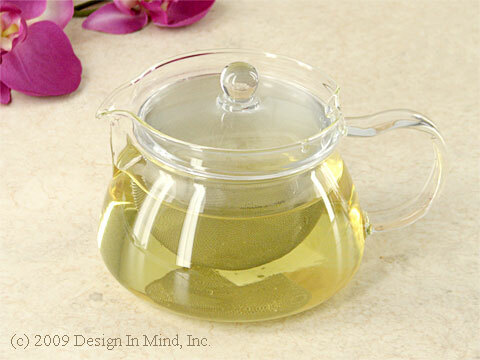 Small teapots that hold 12 to 20 ounces for one to two servings. 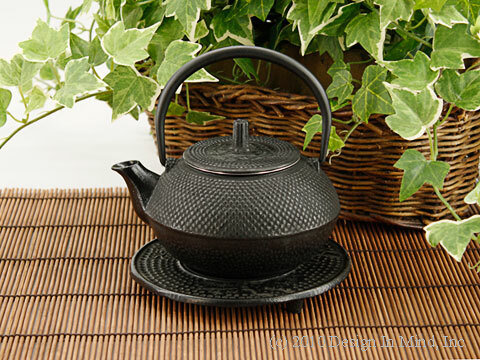 Bamboo, pine and cherry blossoms decorate this cast iron teapot with matte brown exterior and black enameled interior. Includes a stainless steel mesh infuser basket. Handle folds down. Holds 20 ounces. About 6 inches high (with handle up) and 6.5 inches wide. Includes 5.5 inch matching cast iron trivet. Made in China. Use a medium size Tea Quilt tea cozy. 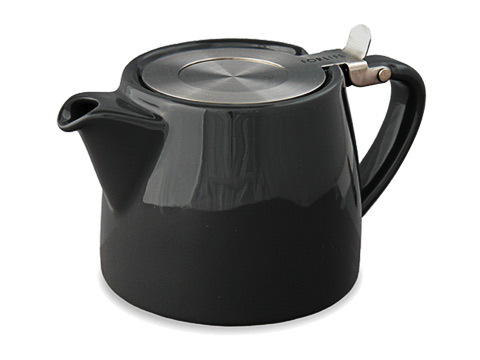 Strength cast iron teapot with black enameled interior. Matte black finished exterior. Includes a large stainless steel mesh infuser basket. Handle folds down. Holds 16 ounces. About 5.5 inches high (with handle up) and 5.5 inches wide. Trivet not included and no longer available. Made in China. Use a personal size Tea Quilt tea cozy. 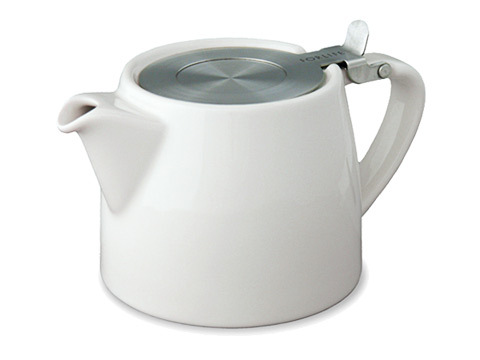 The White Basics 3 cup teapot is a great size for one person. 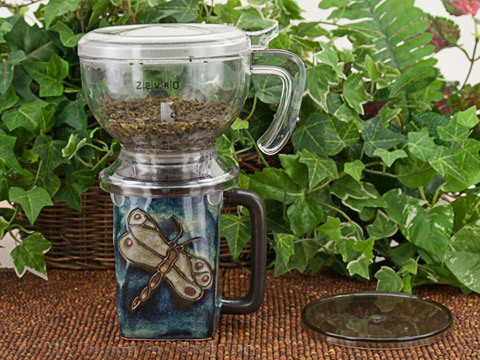 It serves up 18 oz of fresh brewed loose leaf tea, enough for a large mug or 3 teacup size portions. The 3 cup size takes a Personal Size Tea Quilt tea cozy. We recommend size #2 t-sac filters for this teapot. Gift boxed. Made in China. 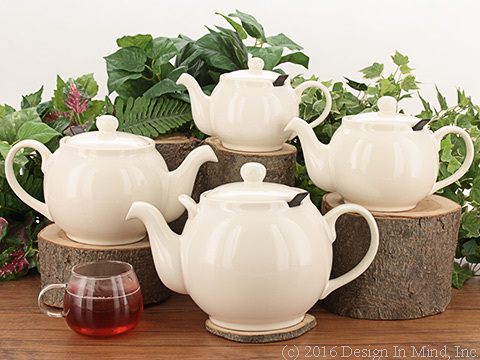 White clay stoneware teapots designed with a Finum infuser basket. The lid locks in place with or without the infuser. 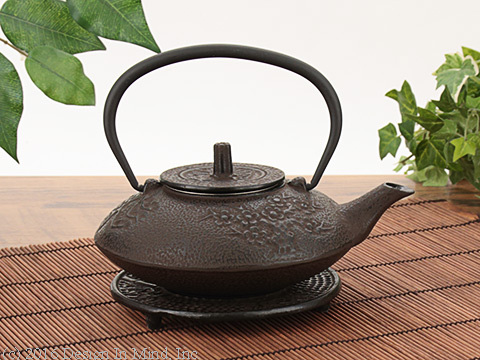 These teapots are an excellent choice for loose tea. Infusers are made in Germany. Packaged in Germany. Available in four bright colors. 2 cup (16 oz.) capacity. 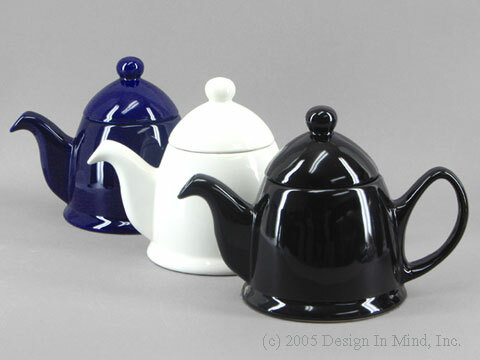 Heavy stoneware teapots in three colors. Only black remaining. 16 oz. size. Accepts the Finum medium infuser or #2 t-sac. Use a medium size tea cozy with these teapots. Also see the matching mugs. 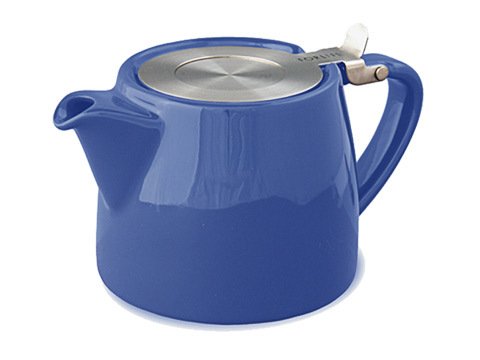 Chatsford teapot in bright blue! The large nylon mesh infuser is excellent for preparing loose leaf teas. Available in four sizes. Chatsford teapot in jade green! The large nylon mesh infuser is excellent for preparing loose leaf teas. Available in three sizes. 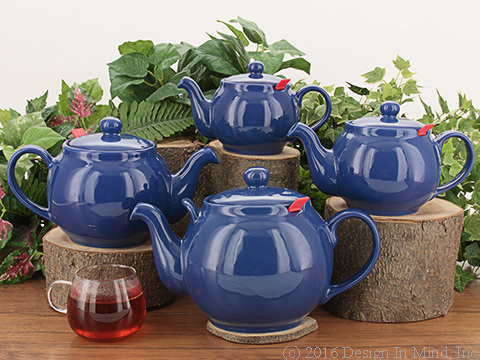 Peter Sadler teapot in a deep indigo blue. In sunlight it is almost purple. Peter Sadler teapot shown with Gameboard Tea Quilt (Leisure group). 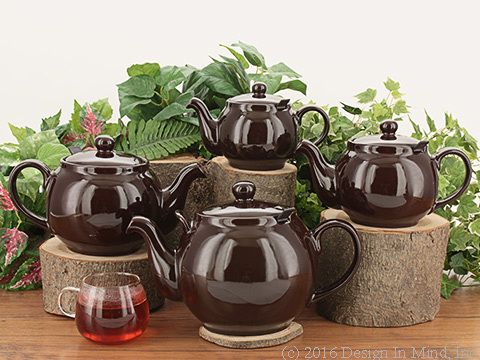 The teapot is the traditional Rockingham brown glaze. Peter Sadler teapot shown with Garden Postcard Tea Quilt (Garden Botanical group). This teapot is hunter green. Peter Sadler teapot shown with Tudor Estate Tea Quilt (Garden Botanical group). 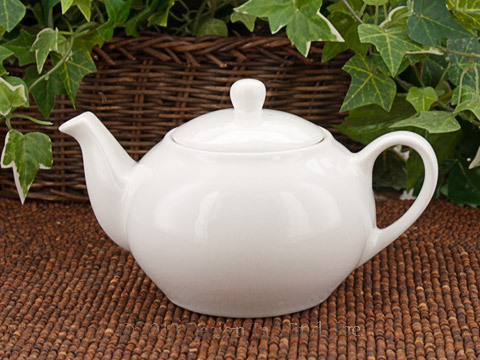 This teapot is a bright white that will go well with almost any Tea Quilt. 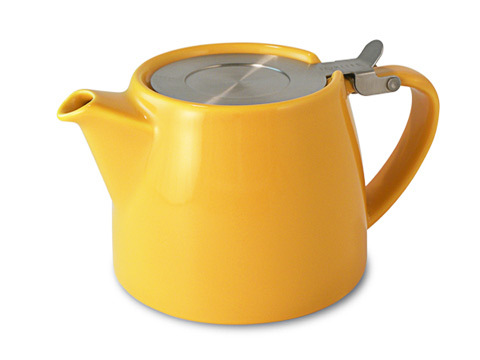 Peter Sadler teapot in mustard yellow, with a little more brown tone. The stump teapot by Forlife comes with a super fine stainless steel infuser and a tip back flat stainless lid. Holds 16 oz. Use a personal size tea cozy. The stump teapot by Forlife comes with a super fine stainless steel infuser and a tip back flat stainless lid. Holds 16 oz.of colors. Use a personal size tea cozy. Please Note: Discounted items do not qualify for My Rewards points.